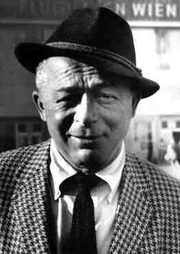 Billy Wilder was born Samuel Wilder in Sucha, then part of the Austro-Hungarian Empire. His mother had spent several years in the USA in her youth and is said to have nicknamed her son "Billy" because of her fascination with Buffalo Bill. Wilder briefly studied law in Vienna, originally intending to become a lawyer, before abandoning that career for journalism. He wrote for a Viennese newspaper, producing crime and sports stories and interviews. In 1926, he took a publicity job in Berlin with the American jazz bandleader Paul Whiteman. He stayed on in Berlin writing for the city’s largest tabloid newspaper. In 1929, he broke into films as a screenwriter, and wrote scripts for numerous German films until the Nazis came to power in 1933. He left for Paris, then emigrated to the USA. Although he did not speak English when he arrived in Hollywood in 1934, Wilder was a fast learner, and thanks to friends such as Peter Lorre, with whom he shared an apartment, he was quickly able to start working in American films. In 1938, he began a fruitful writing partnership with Charles Brackett. They evolved into a producer-director team in 1942, with Wilder directing, and turned out box office hits such as Five Graves to Cairo (1943), The Lost Weekend (1945), and Sunset Boulevard (1950), winning several Academy Awards along the way. After the partnership dissolved, Wilder's self-produced films were more caustic and cynical, though he also produced successful, classic comedies such as Some Like It Hot (1959) and The Apartment (1960). He retired in 1981. Billy Wilder is currently considered a "single author." If one or more works are by a distinct, homonymous authors, go ahead and split the author. Billy Wilder is composed of 4 names. You can examine and separate out names.